This project aims to provide Web Services Data Source ODA implementation for BIRT and other ODA consumer applications. The BIRT Web Services Data Source is an ODA extension that enables BIRT (and other Eclipse DTP/ODA enabled application) to query SOAP-based web services and use the query response as a source of reporting data. The Web Services ODA (WS-ODA) extension is built on top of the DTP/XML data source (XML-ODA). The WS-ODA driver reuses XML-ODA driver’s XML to relational data mapping facility to handle the tabular conversion (“flattening”) of SOAP response data. The WS-ODA driver therefore has a dependency on the XML-ODA driver. WSDL is the most common service description language for Web Services. The WS-ODA design-time driver understands WSDL, and can use information contained therein to help the user define the following properties required by the runtime driver: the soap endpoint, the soap request template (by reading the request message schema) and the XML-relational mapping (by using the response message schema). This driver supports WSDL 1.1. The WS-ODA driver supports data set parameters. User-defined data set parameters may be created, and any part of the SOAP request may be bound to the runtime value of a data set parameter. Where the WSDL descriptor of a web service is not available, the user may directly enter the template SOAP request message. Data set parameters may be added to the SOAP request using special syntactic markers. The user may also modify the SOAP message template initially generated from WSDL. Java classes that implements a number of driver-defined connection and query methods may be used as the source of the XML data. This is useful in the case where the user already has client code to process the web service request, or when the web service uses a connection or authentication scheme that’s not supported by the WS-ODA driver. The WS-ODA driver has native support for web services that uses SOAP over HTTP. The full SOAP message, including SOAP headers of the request and response messages, can be accessed by the data source consumer. The entire XML to relational mapping facility of the DTP/XML ODA driver, including its drag-and-drop mapping UI and its advanced XPath expression support, is available to the WS-ODA driver to map a SOAP response message to a tabular result set. The ODA Data Source for the Web Services ODA driver is named “Web Services Data Source”. The ODA data source identifier and the data source runtime driver plugin name is “org.eclipse.datatools.enablement.oda.ws”. 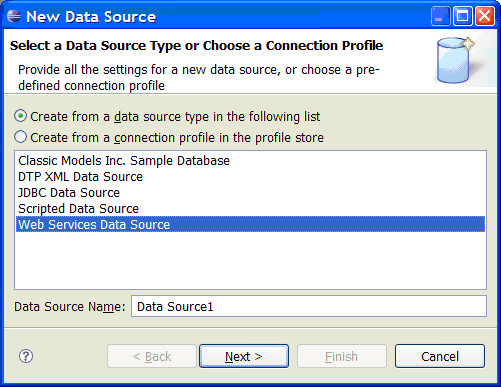 The data source designer plugin name is “org.eclipse.datatools.enablement.oda.ws.ui”. A Web Services Data Source defines properties for establishing a connection to a web services provider. The connection can be made by the driver via SOAP/HTTP, or through a user-provided Java class. 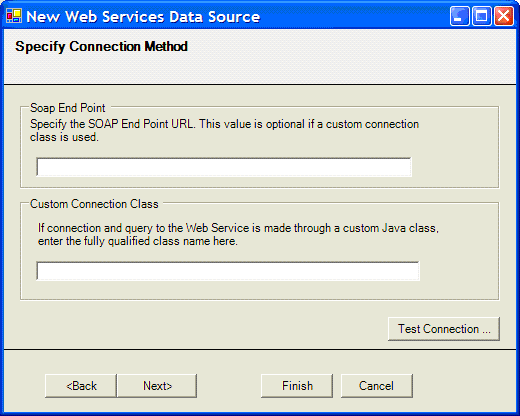 soapEndPoint SOAP End Point A URL for the SOAP/HTTP endpoint that the driver should connect to. E.g., "http://www.classicmodelsinc.com:5670/products"
driverClass Custom Driver Class Name If this property is defined, connection and query are made through a user-provided Java class by this name. See Section 1.3.4 Custom Driver Class for specification of the custom driver class. driverClassPath Custom Driver Class Path A semicolon(;)-separated list of additional JAR files and directories to search for the custom driver class. If the driverClass property is set, BIRT first searches this list for the custom driver class. It will then use the application class path if the driver class is not found. connectionTimeOut Connection Timeout (in seconds) Number of seconds allowed for establishing a connection. Default value is 60 if it is not defined. The following UI mockups illustrate the workflow of creating a Web Services Data Source. Note that the actual implementation of these UI pages may differ from the mockups. 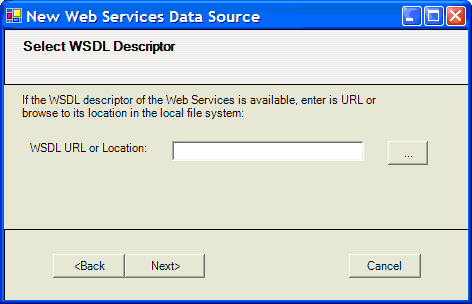 The first wizard page asks the user to specify the WSDL descriptor of the Web Services to connect to. WSDL descriptor is an optional property. If it is specified, this dialog should verify that the specified URL or file is valid, and that the target is a well-formed WSDL document. The designer should store the value of the WSDL URL/location as a data source private property, as the WSDL document will be accessed again during data set creation to help define SOAP request template and response mapping. The second and final wizard page asks the user to specify the SOAP end point URL and the driver class specification. One or both of these two sets of properties must be defined. If the Customer Driver Class property is defined, the driver will use the custom driver class to connect and query the web service. The SOAP End Point property may be left empty in this case. If SOAP End Point is also specified, its value will be passed to the custom class’s connect method as a connection property at runtime(see Section 1.3.4 Custom Driver Class ). If the Custom Driver Class property is left empty, the driver will use the SOAP End Point URL to establish a SOAP/HTTP connection. The SOAP End Point property must be defined. If a valid WSDL descriptor is provided in the last wizard dialog, the SOAP End Point input box will be pre-populated with the first service port location read from the WSDL. The user may edit this value to override the port location defined in WSDL. The Test Connection button attempts to validate the connection method specified by the user. If a Custom Driver Class is specified, the wizard will attempt to load the class and call its connect() method, passing in the Soap End Point value and an empty application context map. If a Customer Driver Class is not specified, the wizard will attempt to connect to the specified Soap End Point. Any exception incurred in this process will be reported to the user, but will not prevent the user from finishing the wizard. TODO: update mockup to include driverClassPath property. Rename "Connection Class" to "Driver Class". If the data source’s driverClass public property is set to a non-empty string, the runtime driver will use a custom driver class to create connections to the web service. The custom driver class will also be responsible for executing the web services queries for Web Services Data Sets associated with this data source. The driverClass property is the fully qualified name of a Java class which must implement the following class method to establish a web services connection. The Java class must be in the application class path or the class path defined by the driverClassPath property. The connectionProperties parameter specifies the runtime values of all public connection properties available to the driver as a (String, String) map keyed by connection property name. The map may contain any or all of the following map keys: soapEndPoint, connectionTimeOut, driverClass and driverClassPath. The appContext parameter provides all the application context values as (String, Object) pairs. Its value is never null, but its collection may be empty. The connect method of the custom driver class, upon establishing a successful connection, will return a non-null object which implements the following two methods. The queryText parameter specifies the query text. It can be null if the connection class does not require the report design to provide a query text. The parameterValues parameter specifies values of all the data set parameters as a (String, Object) map keyed by parameter name. It may be null if the data set does not define any parameters. The queryProperties parameter specifies values of all the data set public properties as a (String, String) map keyed by property name. The map may contain any or all of the following map keys: queryTimeOut. java.lang.String: the returned String is the complete SOAP response. java.io.InputStream: the returned stream is SOAP response stream. This method closes the connection. Implementation of the close method is optional. If it is implemented, the driver will call this method when the associated data source is closed. The driver calls the custom driver class using Java reflection. Therefore the class and its connection object do not need to implement any predefined interface. Any exception thrown by any of the methods defined above will be treated as error and will result in a failure and an ODAException being thrown.